Trampoline Pads - Trampoline for Me! Even if you protected you trampoline from falling off of it (with enclosures), you will need pads in case you fall – and that is the point of jumping on the trampoline, right? Now, all of the trampolines come with pads. Why would you want to know anything about them and maybe even buy them? It’s simple. Try owning a trampoline for a couple of years and actively use it. Pads get worn out and they stop protecting you from fall. If they are really worn out, sometimes they can do more harm than good. Luckily, I always kept an eye on this little detail so nobody got hurt in my backyard. 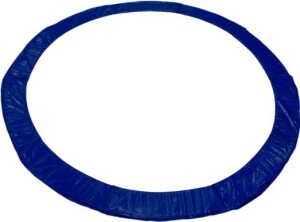 And since I’ve owned a trampoline for a number of years now, I can say that I’ve bought quite a few of these extra pads. This is a really simple matter. You just need something to make pinching hazard as least likely as possible and that’s all, right? Yes. So why should I even write this page? Some people get confused and try to make a science out of choosing the right enclosure after yours has broken. If this doesn’t work, you’re doing something wrong. Also, there are a couple of regular things that happen to enclosures which you can patch, but I’d still go with the new one. If the straps that hold pad attached are broken, you can either sew it or try to patch it with the burner (although I can’t say for sure that the second one will work for you). If the pad is torn on one place, you can try and patch it with some sponge or foam-like material, although this will look really ugly. Anyways, patching is just until you get your replacement pad, bear that in mind. As for attaching a safety pad, that’s one of the easiest jobs on earth: you just put it into its place, strap it and you’re done. That’s all. Hope I helped a little. If you have any extra questions, feel free to contact me.